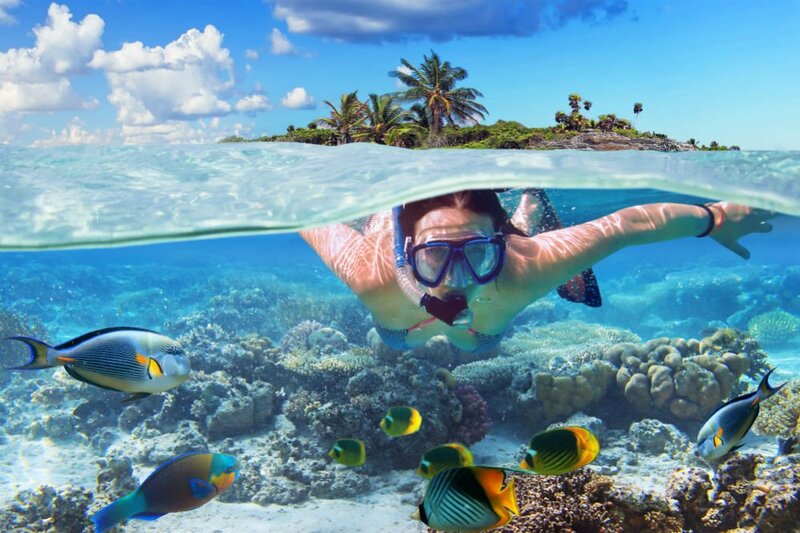 Snorkeling is a fantastic activity for anyone who is interested in exploring marine life. There is a whole other world just below the ocean’s surface, and with the right equipment, you will have the ability to venture into this world comfortably. However, not everyone is a born natural when it comes to breathing through a plastic-formed tube while swimming. Below is a great starter’s guide to learn how to snorkel and other snorkeling tips you’ll need for your upcoming trip. Depending on how serious you want to take on snorkeling, you’re going to need the right gear. Sure, if you’re just playing around in your backyard swimming pool, you can likely get away with an inexpensive kit from a department store. On the other hand, if you’re venturing out into the ocean, you’ll want a much better piece of equipment. Remember: as a human, you need air and being in the water can put you out of your element. Hence, you’ll want to stay calm, comfortable, and confident in your gear. Going to a dive shop will give you access to tons of highly rated equipment. Not to mention, you can also use the sales associates as your professional shopping assistants. While it’s often that resorts sell their own scuba equipment, it’s likely overpriced and poorly made, which is why you’ll be better off visiting a dive shop. For beginners, the best thing that you can do is to invest in a snorkel package. These are specifically manufactured for people who don’t have specific equipment requirements. You’ll receive a package price for everything that you need, including a mask, snorkel, and fins. When buying a mask, you’ll need to make sure that it fits properly. Place the mask on your face and tilt your head back, taking a deep breath through your nose. Then place your head upright and see if the mask sits on your face without any air leaks. If any air gets through the mask, then water will as well, and you don’t want that. There are a few different types of snorkels you can choose from, which include dry, semi-dry, and traditional snorkels. For beginners, it’s recommended that you choose a dry snorkel because they have float valves and splash guards. Float valves prevent water from entering your breathing tube while underwater. Splashguards also repel water from splashing waves while on the surface. You might be a great swimmer in your backyard, but have you tried swimming with fins? There’s a very specific kicking motion that you need to do in order to propel yourself through the water. It’s best if you’re able to practice these skills before your trip. In fact, your local dive shop likely knows of snorkeling lessons that you can sign up for. Snorkeling lessons teach you much more about the activity than just swimming. You’ll learn about important safety tips, how to take care of your gear, and how to use snorkeling gear without a life vest. Not to mention, you’ll also be able to get a strong understanding of your breath hold so you can snorkel under the water. 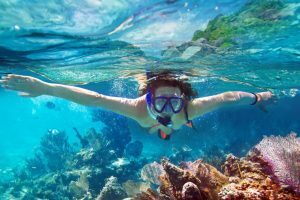 Before you head out for your snorkeling excursion, it’s best if you choose an area recommended for beginners. 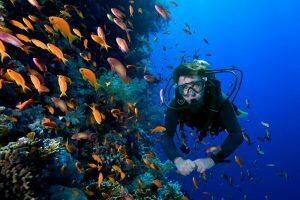 Typically, resorts will know all of the best places to visit if you want to see picturesque underwater experiences. You’ll want to make sure you choose a location with calm waters, as you won’t want to be working against the waves. Calm water also makes it much simpler to navigate through the water. Plenty of first-time snorkelers find themselves at an inactive reef, which has them questioning why they learned to snorkel in the first place. For this reason, it’s also important to find an active location, as it helps to make the experience far more enjoyable. You’ll want to see all of the exceptional vibrancy of marine life, after all. No matter if you’re a first-time snorkeler or an experienced one, a buddy system is of the utmost importance. As you’re navigating through water, there are unexpected events that could happen. For beginners, you’ll want to consider pairing up with someone who knows more about snorkeling than you do. They can help you with your techniques, bring you to interesting locations, and keep you safe. Remember, you’ll be dealing with currents, wildlife, and reefs all at the same time. Even though you might be tempted to poke at a beautifully colored fish that swims past your mask, it’s one of the worst things you can do. Marine life is there for your viewing pleasure, not for you to touch. Physical interactions can disrupt the entire ecosystem just below the ocean’s surface, and you don’t want to make anything feel threatened. For beginners, it can be nearly impossible to determine if something is poisonous or not. In line with this, at no point should you ever grab for another person if you find yourself starting to panic. Pulling other people down is extremely dangerous. Instead, lie on your back and float to the surface, taking deep breaths. While safely floating on your back, you can then call for help. When you’re finally in the water with all of your gear, two important things to remember are to breathe and relax. Snorkeling is supposed to be a soothing activity, not something that you flail your arms while doing. In fact, an advanced tip is to fold your arms across your chest while you float along. Your fins should do all of the work for you. However, if you find that you can’t get comfortable in the water, there’s nothing wrong with using a life vest to help you focus on your breathing. Once you’ve finished snorkeling for the day, it’s important to take the time to clean your equipment properly. Even if you’re going out into the water the next day, you’ll need to get rid of sand and salt residue. Using warm water and a mild detergent, clean your snorkel, mask, and fins thoroughly. You can then leave them to dry overnight in a cool and dry place. Keeping your gear clean will keep it pristine for longer and ready to use the next time you go snorkeling. 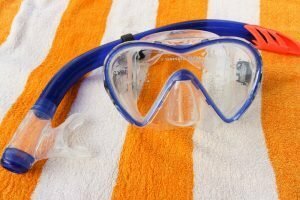 Overall, the best way to learn how to snorkel is to sign up for classes. It’s an amazing activity for anyone who is curious about the ocean, but there are many skills you’ll need to master first. 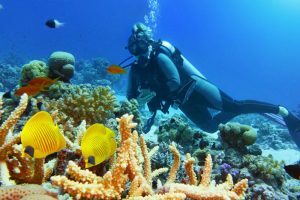 From breathing effectively to maneuvering your body with fins, with the right experience, you can easily navigate through everything marine life has to offer. It was nice to know that there are snorkeling areas that are recommended for beginners to make sure that you won’t end up working against the waves. My husband and I are interested in snorkeling to see coral reefs. This will be our first time snorkeling, so we want to ensure a positive and safe experience for us. 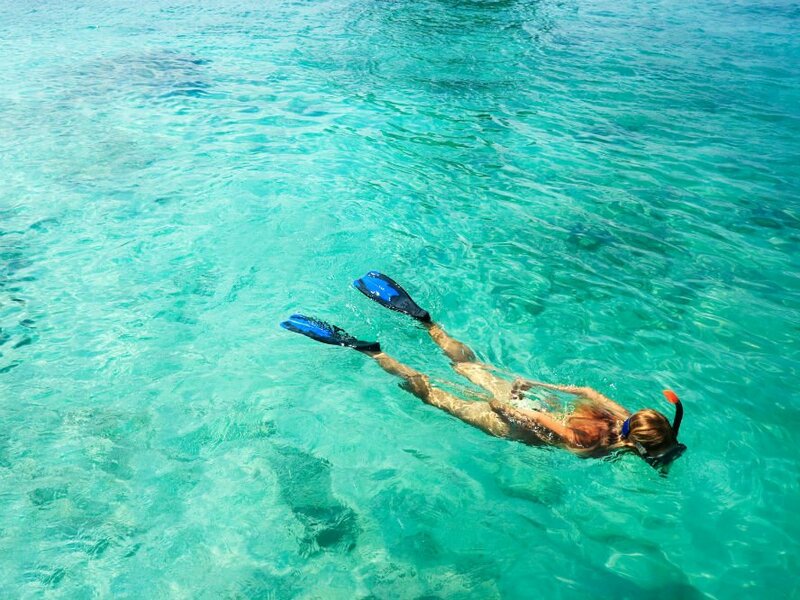 Since we were young, we have been wanting to try snorkeling adventures. Thanks for sharing this. Cleaning your equipment is a good idea. 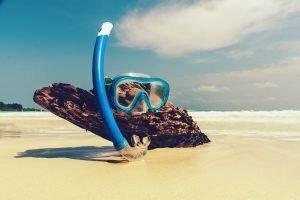 This is a great way to make sure that you are getting the best for your snorkeling hobby. I was interested in trying this activity while on vacation and will look into this. I like how when you want to get into snorkeling, you should at least choose a place where you can go and start with the beginner’s class since these things take time and you wouldn’t want to charge in blind now, right? 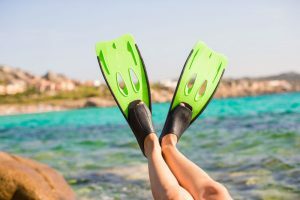 Another thing to keep in mind is that you should always dive with a partner in order to lessen the chances of accidents happening out in the water. While I have no idea how to dive, much less snorkel, it’s at least comforting to know that you’d have a buddy alongside you when you go diving for the first time. Yes! Always with a dive buddy!